The Catholic Archbishop of Abuja , John Cardinal Onaiyekan , says it is worrisome that the older generation is refusing to leave the scene for the younger generation . Onaiyekan , who is a former President of the Christian Association of Nigeria, said this at the presentation of a book titled , ‘Dignity in Service,’ authored by the late Dr . Matthew Mbu , a former Minister of Foreign Affairs. Also, the Minister of Transport, Rotimi Amaechi, said at the event that he earned “only N950,000” a month out of which he also paid his aides. The cleric said the post- independence leaders like the late Chief Obafemi Awolowo, Nnamdi Azikiwe and Abubakar Tafawa-Balewa, were young when they did great things for Nigeria. He said it was this sort of orientation that caused the late Mbu to be appointed a minister at the age of 23. Onaiyekan , however , wondered if the younger generation could be given the sort of opportunity that existed in the 1960 s .
The cleric said , “ The point I want to make is this ; today when you hear that a young boy was a minister, my mind always goes to those days too and I ask , how many people were old then ? The people we now see as ancestors were all young people. I will like to find out the age of Tafawa Balewa and even Awolowo at that time. “ They were all relatively young and when Awolowo and Azikwe broke grounds then, they were young . I think this is the story we need to tell to our younger people but the question is, where is the space for our younger people when old people like me are still hanging around ? The cleric, however , stated that being young did not always imply that a person would be competent . “ So at the end of the day , maybe it is not a matter of the age but a matter of your own mind, your intention , your love for doing the right thing especially concern for others, politics and service to the people in the name of God. If we start to take these things seriously then probably it would not matter whether we declare to seek re – election at 79 or whether we don’t,” Onaiyekan said . In his remarks , Amaechi, who was the chairman of the occasion, said it was not true that only past leaders were honest . While extolling the virtues of the late Mbu, Amaechi who was governor of Rivers State between 2007 and 2014 , said he would continue to promote transparency . To prove his claim , the minister revealed that he earned “only N950,000” a month out of which he also paid his staff . 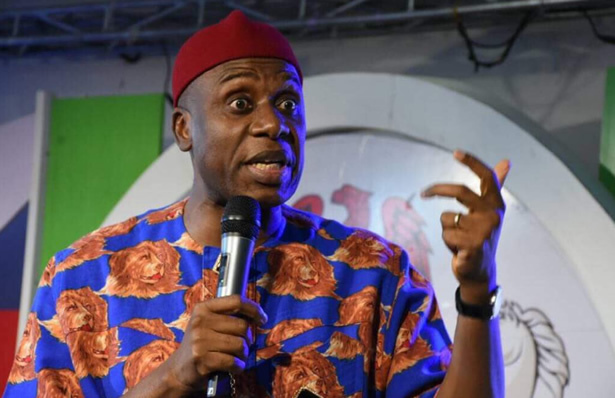 Amaechi said President Muhammadu Buhari’s government had helped to stop the culture of waste such that private citizens no longer throw lavish parties . The minister added, “Nigerians like going to parties . That is one benefit of this government. We now assess our wealth and value money . Before , once you get money from the illegal means, we hold parties. There are very few parties these days because there is no more money to hold such parties .